Our bus ride from Beaune to Paris was much shorter than many of the rides we'd had on this trip. For almost three weeks, Dirk has been our driver (and a very good one). He is an easy going fellow who became quite animated while I chatted with him at dinner one evening about motorcycles. Anyway, we arrived in Paris a little after lunch and Dirk dropped us off on a busy corner. We all had told him goodbye while still on the bus before our stop as we knew we were going to have to make a quick exit on a busy street. 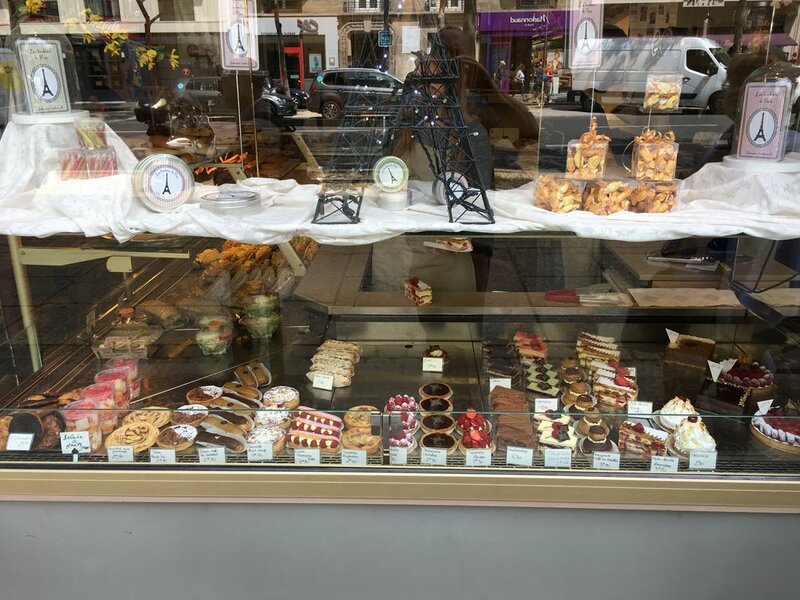 The pastry shop below was very near our hotel, and we came back here to grab a quick lunch before beginning our orientation walk around the part of Paris we were staying in (the Rue Cler area). I should know what the buildings in the image below are, as I am sure that Jesse told us while we were walking, but I cannot remember them. 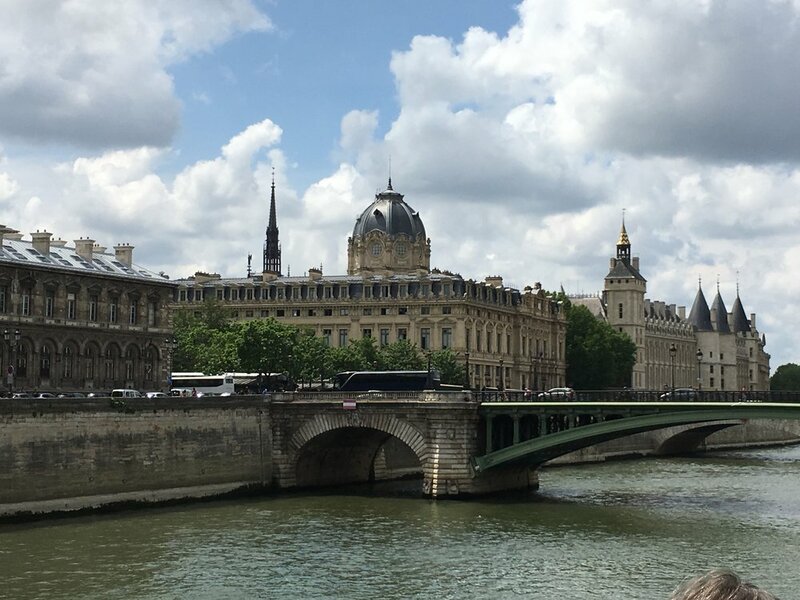 We ended up on the little island in the Seine River where Notre Dame and Sainte-Chappell are. We passed a small park on our way to see Notre Dame and Sainte-Chappell. 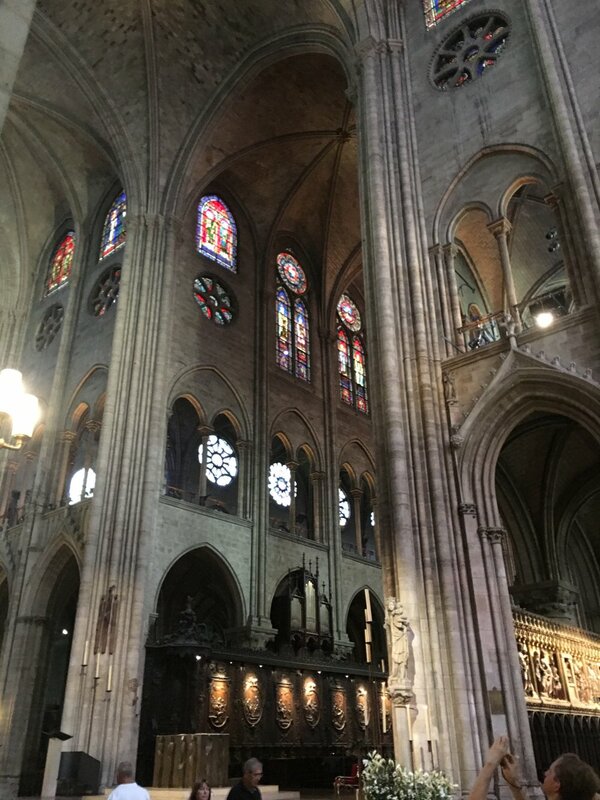 And here it is, the cathedral of Notre Dame, gargoyles, flying buttresses and all! 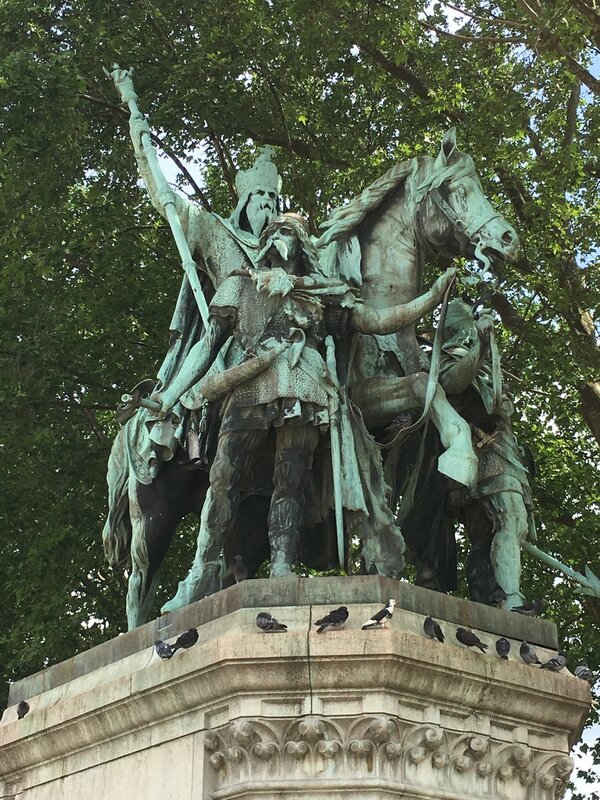 Huge bronze sculpture of Charlemagne outside of the cathedral (below). Inside the chapel upstairs at Sainte-Chappell, beautiful stained glass windows all around. Janice's observation of all these beautiful old churches and cathedrals that we've seen is that they are sad. Sad that the original thoughts and vision which lead people to make great structures for God and for His work are now little more than museums of ancient history. That is sad. Jesse said that a picnic in the park was an excellent way to spend an evening in Paris. We thought it sounded like a good idea, so most of our group descended on a small grocery store and bought all sorts of bread, meats and cheeses, drinks, chips, vegetables, cookies, and other picnic foods and went to the Luxemborg Gardens. We had so much food, and it was so nice sitting in the grass and talking with our friends. When we were all stuffed, we put all the leftovers in a couple of bags, and Janice and Kim gave it to some Spanish college guys (the three guys on either side of Janice in the second photo below). They were amazed and pleased and seemed so happy to have received this "leftover" gift! After walking 19,000 steps (a little over seven miles), and after dinner, we walked down to the Eiffel Tower. The photo below was taken at 10PM. It's just so amazing to us how it stays light so late. And this must be do to the more northerly latitude of France compared to Yadkinville!